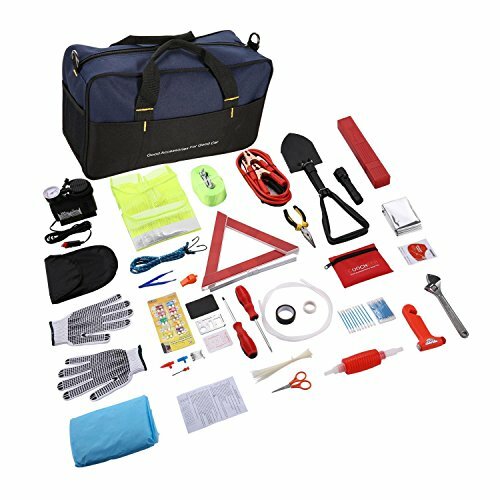 Ultimate Safety On The Road: Feel protected, secure and Always Prepared with this 149-piece premium vehicle emergency tool kit, knowing that you and your loved ones are finally roadside emergency-proof. 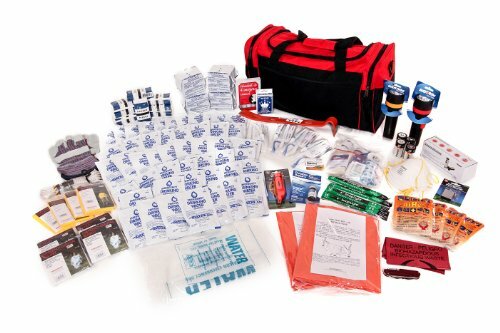 A Real All-In One Solution: This premium 149-piece auto emergency kit comes in a small bag that fits anywhere in your trunk, backseat or spare tire compartment. It’s small, well-organized, effective, and very useful in a variety of roadside emergency situations. Durable — This emergency kit was made of high quality ABS and Alloy to guarantee the durability. What’s more, it is also heavy duty and eco-friendly. 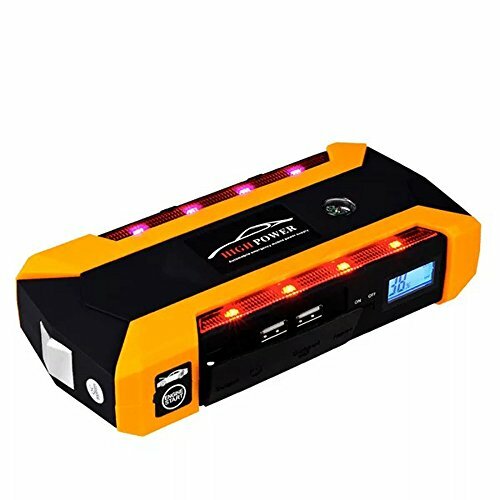 Small but Powerful — Multi-function and easy to use, perfect little roadside car emergency kit is to save your car in an emergency situations, especially for new drivers. 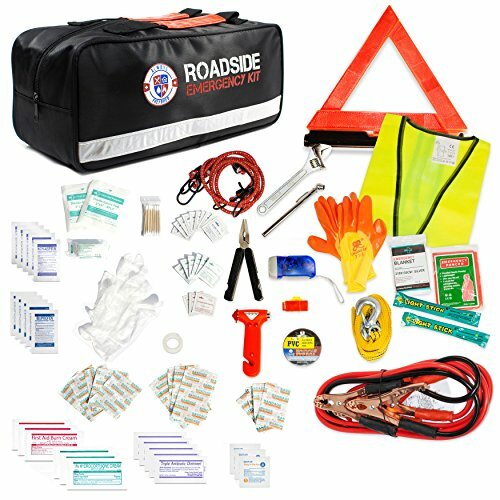 Ultimate Safety — You will feel protected, secured and Always Prepared with this 46 piece premium vehicle emergency tool kit. PROFESSIONAL QUALITY CAR EMERGENCY TOOL: Constructed with military-grade aluminum for durability and protection, autoXscape is designed with the safety of you and your family in mind. This compact, ergonomic and multi-function safety tool features a textured rubber knurling that improves grip in cold and wet environments. It’s fully waterproof and impact resistant. 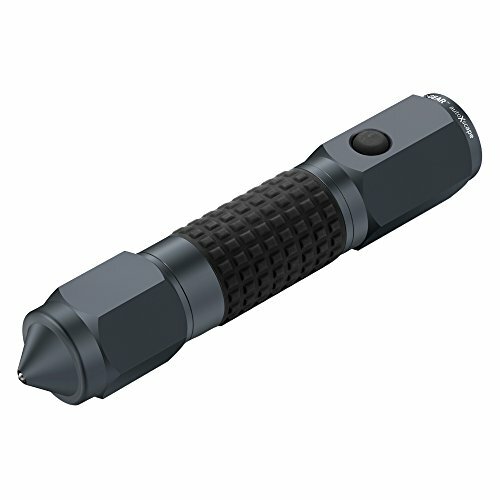 BRIGHT LED FLASHLIGHT: Features 3 modes: high (135 lumens), low (50 lumens), and an S.O.S mode, which is crucial in an emergency scenario. Also included is a high-strength mount, equipped with screws and 3M adhesive pad to keep in your vehicle. SEATBELT CUTTER & WINDOW GLASS HAMMER: The seatbelt cutter is made with the hardest carbon steel blade and slices through the toughest seatbelt like butter when seconds count. The window breaker is constructed with tungsten steel and sharpened for maximum puncture to break any tempered car window. For moments of extreme desperation, there is a second window glass punch on top of the cap. Package: The kit is packed in a well-made fabric bag with excellent stitching and velcro closure, heavy duty strap adjustable for easy carrying; The Shovel itself has its own protective cover to protect from cutting. Just the quality of the bag itself tells the user that this is a serious survival kit. 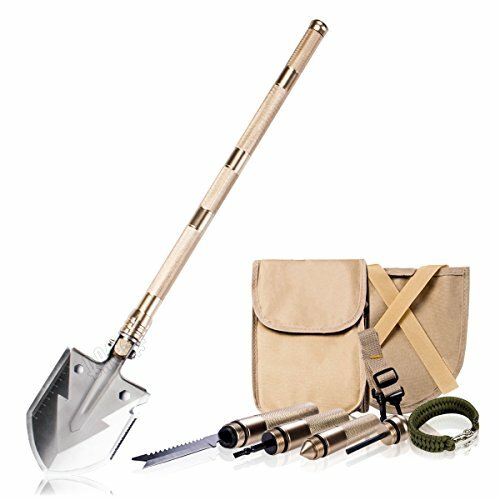 The set comes in 5 pieces: a magnesium flint rod with compass, a handle with screwdriver, a handle with a glass breaker or attack cone, a handle with multifunctional saw knife, and a shaft with shovel head, all fit nicely and securely into the carrying pouch. When assembled the shovel is nearly 29″ long and spade 6.5″ wide. Easy assembly with no instruction needed. Multiple purposes shovel head: with a can or bottle opener, 2 wrench size holes, a very sharp knife blade on one side and a saw blade on the other side, and a ruler. Adjustable the angle of the spade, you can tighten down the shaft at an angle and have a hoe to use, also easy and small storage of the folding shovel. 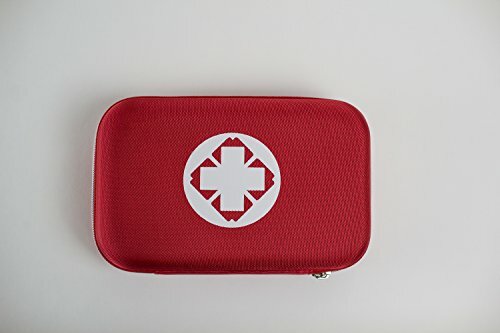 CONTENTS – Each deluxe kit is complete with 180pieces of all-purpose emergency treatment supplies essential for having on hand in case of an unexpected major or minor medical event. So you can carry it with you no matter where did you go. FDA APPROVED – All the supplies are passed the FDA certification with high quality. 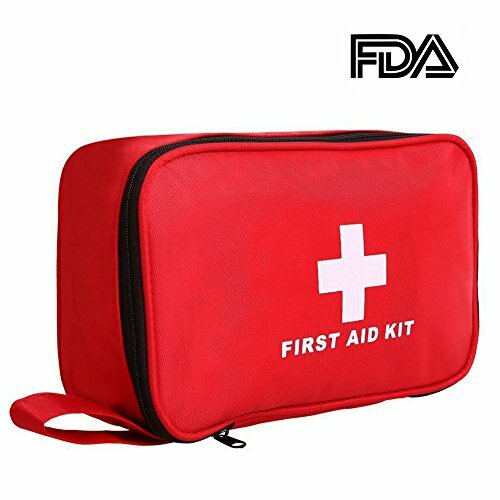 Approved facility exceeding safety standards for emergency first aid, for adults and kid.Offer you more guarantees than other normal seller. 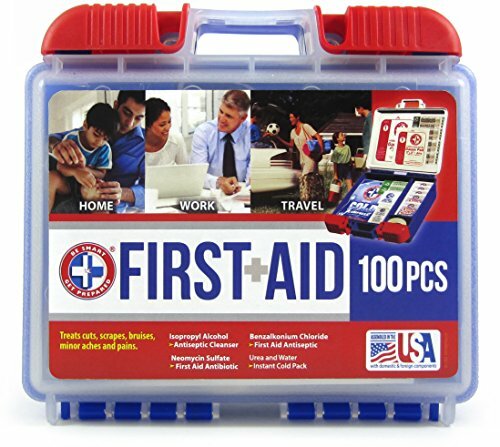 ALL PURPOSE- Small and lightweight.From basic home use to outdoor wilderness survival, this kit is quite versatile and can be used for homes, offices, camping, cars, sports, boats, road trips, workplace and schools. 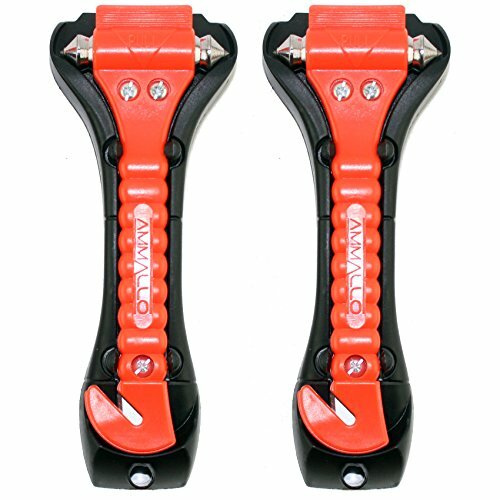 [Powerful] Jump start your vehicle up to 30 times with 400 amps of peak current and heavy duty clamps and cables. Life expectancy of up to 4-6 years,Can be recycled more than 500 times. All kits Compact enough to store in your box. [Fast charging]20000mAh Battery Capacity and 4 Smart USB Charging Ports. It can full charge your laptops(Part of the round power interface of the laptop,NOT apply to Apple), smart phones, tablets, and other devices at the fastest speed possible. 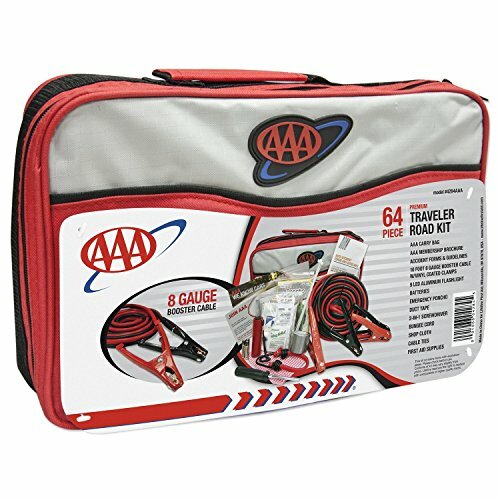 A Must Have – Safety Tool Kits: these 4 packs car emergency kits are very suitable for flat terrain, suitable for roadside breakdown or other emergencies. And they can provide support to each other and home travel must-haves; You never know when you will need to increase your visibility on the road either for a quick repair or a few hours stranded without a tow. 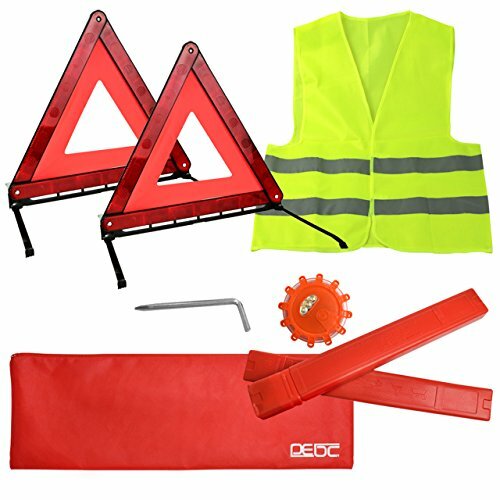 Convenient to carry – The brilliant red reflector on both sides of the triangle is safe at night; Folding Warning triangles, suitable for flat terrain, roadside breakdown or other emergencies. You can organize this emergency visibility kit right into your trunk or under a seat in your car. Collapsible design – for easy car storage and quick set up, no other tools needed. The triangles can fit flat ground, excellent stability. Use these protect yourself, passenger and your vehicle with these early warning sign reflective triangles.